The Cuisinart FCB-501 is a grill cleaning brush. This innovative grilling tool cleans and sterilizes grill with the power of steam. The spray system releases a fine mist that quickly turns to steam upon contact with warm grill penetrating the mess food left behind making it easier to clean. The Powerful 3-Sided Brush is perfect for heavy-duty cleaning. 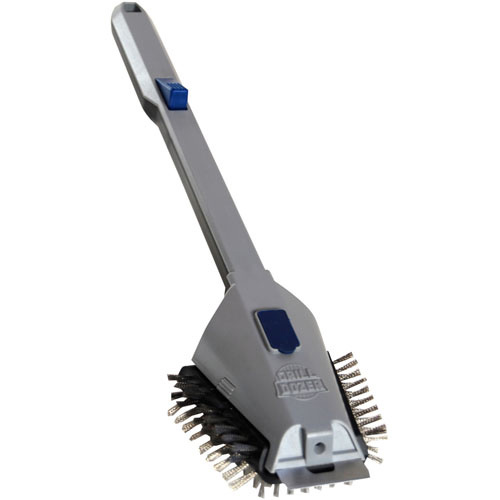 The primary brush surface cleans large areas of grill with a single stroke or turn the brush sideways to attack those hard-to-reach areas under and between the grates. The Grill Dozer Steam Cleaning Grill Brush has many exciting features for users of all types. You can extend the lifetime of your Grill Dozer Steam Cleaning Grill Brush with the purchase of a FactoryOutletStore Factory Protection Plan. 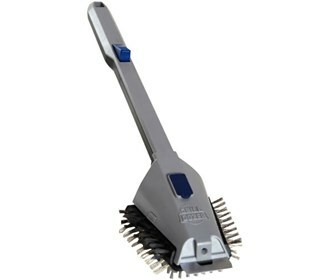 The Grill Dozer Steam Cleaning Grill Brush is sold as a Brand New Unopened Item.